Introducing Our Newest Team Member, Michael Aldea. 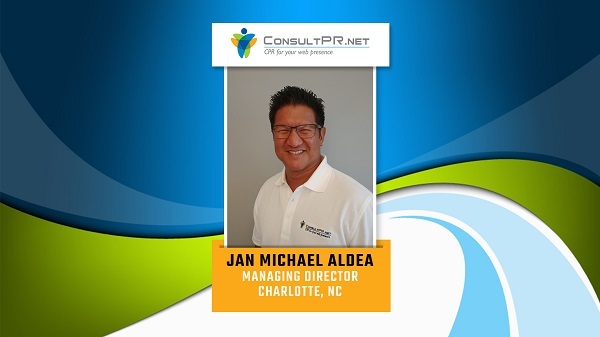 Consult PR is pleased to announce the newest addition to our team, Mr. Jan Michael Aldea! We are excited to have Michael leading our expansion initiatives in Charlotte and the Carolinas. Michael comes to Consult PR after having owned and operated his own digital marketing agency. The move to Consult PR, started with the acquisition of Michael’s existing clients and will continue with an aggressive expansion into the Carolinas in early 2018. Michael’s strengths include helping companies identify blind spots in their marketing strategies and calling on his vast knowledge and experience to come up with “tailored for success” solutions. Michael’s commitment to seeking return on investment for his clients make him a wonderful fit with Consult PR’s like-minded philosophy. Prior to his current position as the Managing Director of Charlotte for Consult PR, Michael co-founded the Charlotte based digital marketing agency, Go Left Marketing. Additionally, Michael’s background includes expertise in Lead Sales force Training at the largest real estate company in the Carolinas; Director of Marketing at two prestigious real estate companies Hilton Head Island, SC, and Savannah, GA. He is also highly proficient in the areas of Website Design and Development, eMail Marketing, Public Relations, Online Reputation Management, Social Media, Brand Development and Digital Marketing. His experience and drive in these areas makes him a great fit for our vanguard team capable of making innovative and unique recommendations for clients. A graduate of Auburn University and the Citadel, Michael lives with his wife and kids in Matthews, NC. He enjoys a round of golf, buttered coffee, fifteen-minute workouts, a craft beer that's hard to find, and relationships that last a lifetime. We are definitely excited to have Michael join our growing team! Join us in extending a warm welcome to our newest team member, Michael Aldea!